It is quite remarkable how much viruses can accomplish with a very small number of genes and a handful of proteins. Previous posts have described the very elaborate lifestyle of HIV with only 9 genes, and Ebola with only 7 genes. Somehow, viruses are able to manipulate vast cellular machinery including organelles much larger than them. They are able to manipulate actin scaffolding for their purposes. They can fool the nuclear pores into allowing them in. They take over the entire machinery of the cell for reproduction. In fact, viruses need help from the cell with many different phases of their lifestyle. 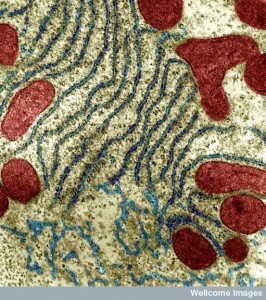 Perhaps their most significant benefactor in the cell is the endoplasmic reticulum. The ER is the organelle that most interacts with virus lifestyles. Despite very different species of viruses using varied molecules, they all have special relationships with the ER. The ER is the part of the cell where proteins are first produced by ribosomes and messenger RNA that has just come from the nucleus. Lying right next to the nuclear pores, the “rough” ER has many ribosomes, the factory that produces protein from the RNA template and then folds them with chaperone molecules. They are called rough because of the dots that show up on electron photos—dots being ribosomes. The area of ER further out from the nucleus is called smooth because there are no ribosomes. Smooth ER produces fatty membranes and connects lipids and sugars to proteins in an almost infinite array of branching structures. This post discusses the very elaborate ways that viruses use the factories in the ER for many aspects of their lifestyle. A previous post showed how viruses can manipulate and evade many other mechanisms in the cell. Viruses life in the cell spans six distinct steps, each needing the cell’s support—entry, making early proteins, copying the virus genetic material, assembly, changing shape and exiting. While other parts of the cell help in some of these steps, only the ER is involved in all of them. To first enter the cell, viruses use many different mechanisms. 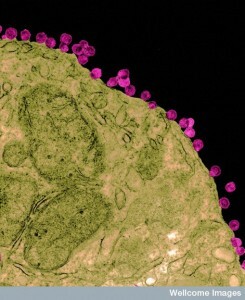 Some take the virus apart first, others trick receptors on the membrane. After entry proteins manufactured either form new viruses or allow reproduction of more viruses. Then assembly is another complex process. The assembly changes the virus shape making it ready for exiting the cell. Viruses suppress the immune system as well (see post). The ER has a huge surface area of redundant membranes with many imbedded molecules, enzymes, chaperone proteins for folding proteins, receptors, and many varied and unusual properties of its bilayer membranes. The ER also connects with other organelles such as mitochondria (see post on communication of ER and mitochondria), Golgi that helps produce and transport membranes, vacuoles and lysosome vesicles to clear debris, and the nucleus. ER is part of the basic pathways that make and transport all proteins and all fatty membranes such as vesicles. The outer membrane of the ER connects with the virus nucleus envelope making many tubules, passages and sheets that form different shapes based on the imbedded molecules. ER is constantly changing shapes. In the rough ER, it makes proteins and folds them. The smooth outer layers of the ER make the fatty molecules (including attaching sugars and lipids to proteins to make lipoproteins). Smooth ER also has many enzymes to get rid of toxins. A special channel takes peptides from the cytoplasm and brings it into the ER for use. Once proteins are made and folded, markings are placed on them, some to direct where they will be sent in the cell. Folded proteins are placed in vesicles (sacs) and sent to the secretory pathway to be transported across the cell, including the outer cell membrane. ER makes fatty acids, cholesterol, phospholipids and many other molecules. Proteins that don’t fold properly build up causing a stress response called unfolded protein response (UPR). This produces more chaperones and stops manufacture of other proteins for a while. If this doesn’t work, then the mis folded protein is transported into the cytoplasm and sent to proteasomes that take it apart. If this becomes too much for the proteasome complex to handle, then the larger autophagy response will eat it using the larger lysosome vesicle destruction factories. ER regulates the vital levels of calcium in the cell with many channels and pumps. Calcium is related to chaperone function. Polyomaviruses, which causes many human diseases, has three proteins. It triggers receptors on the cell membrane that place it in a vesicle for entry. This vesicle takes them to the ER. Chaperone proteins in the ER dismantle the virus structure by breaking disulfide bonds. With this breakup two virus proteins are released. These proteins place the virus into the ER membrane. When these proteins are in the ER membrane, the entire organization and shape of that part of the ER changes. These cause holes in the membrane. Then special ER membranes allow them to travel from inside the ER into the cell cytoplasm. These same ER proteins then further break it up the virus structure, eventually allowing it to go into the nucleus. 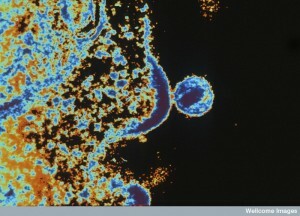 Another virus HPV, which can stimulate cervical cancer, uses the ER for entry without an envelope. It is also carried in sacs to the ER. This also hijacks ER proteins that take it apart. It is also extracted from the ER membrane broken up into components and the brought into the cytoplasm where it moves to the nucleus. Surprisingly, bacteria can use this same mechanism. When the virus DNA or RNA is available after breaking up the virus, it can be used to make proteins, or RNA from DNA. RNA is also made into complementary usable messenger RNA to make proteins. HIV first makes a complementary DNA that is brought to the nucleus and placed in the human genome. 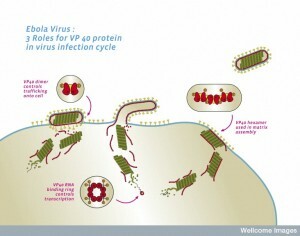 Virus proteins are made to build more viruses in the ER. Later, the genetic material is folded, and inserted into a protein structure. The assembly is often done in particular parts of the ER and the material is transported to that region of the ER for this process. Other virus proteins are produced that help with rapid reproduction. This is also done in a region of the ER. An unusual aspect is that viruses cause special membranes to be built. Pieces of membrane are taken from the ER and altered. 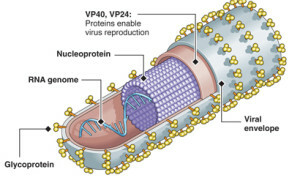 The proteins from the virus are then placed in the membrane to make a factory for reproduction. Surprisingly, ER membranes are remodeled by viral proteins for this purpose. These are called “replication factories”. The ER factory becomes a center that attracts more viral components for the copying and assembly. Hep C is slightly different. 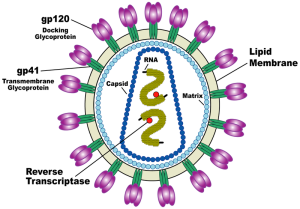 The virus RNA is placed in the ER membrane and makes a single large protein. This is then broken up into ten parts, each a protein with many functions. These include structural proteins to build new viruses. One of them can make holes in membranes. Others are involved in copying of viruses and assembly. Five of these large proteins form a factory in the membrane. Dengue and West Nile viruses are similar, in that they build one large protein that is broken into useful parts. These become part of the ER membrane and remodel the shapes. Polio and enterovirus use a similar strategy. It is still not known how such different types of viruses can use the same tactics. Hepatitis E only does part of the process in the ER and is then sent into the cytoplasm where it somehow evades destruction for the rest of the process. Another virus Rem needs to reach the nucleus and goes first to the ER then to the cytoplasm and then into the nucleus for copying. After placing the enzymes that will copy the virus genome, the cell helps with the process. Most copying and assembly are done in the ER. Almost all RNA viruses except retroviruses use polymerase enzyme made by the virus. 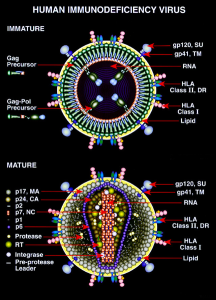 Each virus models the ER membrane in unique shapes. The advantages of this system are that they are protected form the general immune responses that occur in the cytoplasm, all of the components are efficiently placed in a factory, and all the steps can be coordinated. One well-known example is the HCV virus. They form a vesicle that is made of double membranes from the ER. This large vesicle is part of a scaffolding arrangement that is right near the ER membranes. This has been called the “mebraneous web”. The structure is quite complex and involves building extensions of ER membrane, contracting sections and extending others. This is allowed to occur because the ER is in fact very dynamic normally. The proteins go completely through the ER membrane and the assembly is done not inside the ER but on the side that is near the cytoplasm. Five HCV proteins are necessary, but there are in fact, many other ancillary molecules that are needed. The cell’s enzymes make these ancillary factors. One is called PI4P (phosphatidylinositol 4 kinase). Normally, this protein is involved in scaffolding of the cell and membrane shapes. 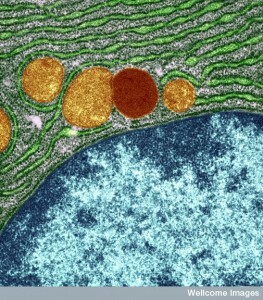 Another molecule attracts cholesterol into the membrane for a particular shape. Other special molecules are needed for the exact shape of the membrane (see post on membrane shapes). Other viruses use some of these molecules and some different (polio). The UPR mechanism is also used by the viruses for this purpose. 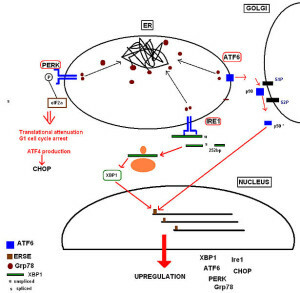 By controlling this pathway, they are able to build the unusual proteins. Another shape that occurs as part of the process is unusual. It is a reverse invaginated vesicle that is in the ER membrane. This is part of Dengue’s life cycle. It is not exactly clear how copying and assembly are so closely related. They seem to have specific locations in the factory. 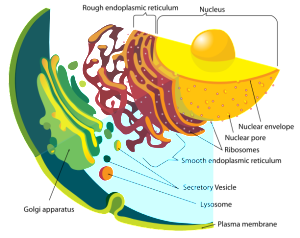 The cell has a compartment called the lipid droplet, which is a place where fats are stored for use in making vesicles. These droplets are attracted to the virus factory. This droplet is able to attract the basic virus protein to build the virus structure. Droplets carry the core virus protein to the location where assembly is taking place in the ER. These core proteins then surround the genetic material (RNA for HCV). Building the nucleo capsid structure of the virus uses several of the viral proteins as well. This completed nucleo capsid then separates into the ER space between membranes fully assembled. This new structure has the vital glycoproteins on the surface. 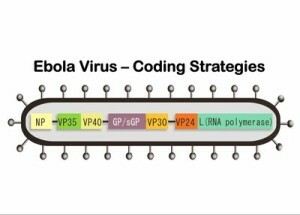 DNA viruses like vaccinia also use ER strategies. It assembles a large envelop around DNA in the ER membrane. It builds in the lumen of the ER without embedding proteins in the membranes. It is not clear how this occurs. After building the virus envelope and structure, it still needs to change shape to launch from the cell at the cellular membrane. HCV uses more steps after being built in the ER. It attracts additional lipoproteins (apolipoprotein E) to the surface of the growing virus particle. Changing shape at the ER has also been outlined for hepatitis B. HCV starts in the form of a filament and then becomes a circular structure. This occurs in the ER. Rotavirus has an initial structure of three layers in the shape of a ball with multiple different proteins making up the layers. The third layer is formed when the double layer forms a hole in the ER and causes increases in calcium throughout the cell stimulating autophagy mechanisms (which cleans debris). Somehow, the autophagy process brings the third layer and places it on top of the others. This mechanism of placing the third layer is very complex and unusual. 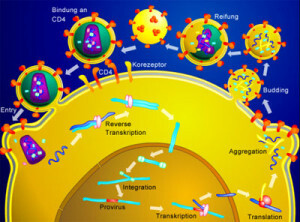 Autophagy moves several virus proteins to the site on the ER membrane. Some parts are on the inside of the ER and some are outside at this point. Combining some of the proteins dramatically alters the ER shape. The layer is sent through the ER membrane and then the ER membrane is removed as the third layer is placed on the second. It is not clear how the ER membrane stuck in between the layers is dissolved. This complex process involves manipulating calcium in the cell, dramatically altering the ER membrane and many ER chaperones and enzymes. Other viruses manipulate the calcium system such as rhinovirus. The ER is a major part of the secretory pathway (see post) that with the Golgi, produces, modifies and transports all membrane material including all vesicles. The secretory transport is used by the virus to transport the newly built virus structure to the cell’s membrane. The complex clathrin process is also used. Clathrin is a scaffolding structure that is rapidly built at the membrane when a vesicle is being released. It is able to allow vesicles to be released out of the cell without creating holes in the membrane. Viruses that don’t have an envelope can break open the cell membrane in order to get out, which can kill the cell. Even with these viruses, a sac is often placed around them for release. Another mechanism that is hijacked by some viruses is the transport from the ER to the Golgi that then directs wider transport in the cell. It is still very difficult to understand how viruses, which some think are not alive, often with only a handful of genes and proteins, can manipulate vast cellular processes such as the endoplasmic reticulum. This entry was posted in Blog, Cellular Intelligence, Microbes and tagged Endoplasmic reticulum makes virus copying factories, Endoplasmic reticulum helps entry of the virus, endoplasmic reticulum helps exit of the virus. Bookmark the permalink. Viruses are making intelligent decisions based on what they can feel, and are acting on them for successful purposes, so of course by definition, they are alive. I suspect they are so adept at manipulating other cellular processes because over eons of time they have mastered the art of strategic deception. They’ve discovered that they don’t need to cooperatively evolve – they only need to pretend to, while they sabotage the constructive efforts and necessary evolutionary purposes of our much more complicated cellular machinery. 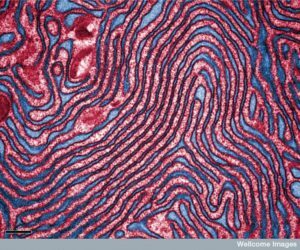 Cellular systems need to trust each other to work successfully. Viruses only need to mimic trust and ride hungrily along. They aren’t the only parasites that have evolved to survive in a similar fashion – they just use the most destructive tactics, which includes much self-destruction as well, after which what’s left of them continue to predatorily re-multiply and move on. Good post. Any unit that behaves intelligently, efficiently and independently is alive. By “independently” I don’t mean that it needs no help, but that it is acting on its own accord. Humans are independent life forms even though we need to eat plants or animals to survive but the macroscopic food we eat (normally… we could eat something that is still alive) is not acting independently of our bodies at all. Viruses demonstrate clear self-supportive movements and intelligent decisions. There is no serious question about it. Viruses are alive. Because Virii can pass the Turning test does not mean they are alive any more then an AI computer program.